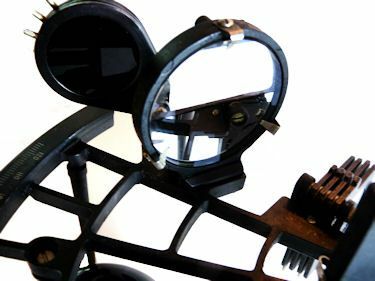 Presented is a brand new Navy MK III sextant made by a hereto-for unknown manufacturer of Navy sextants. 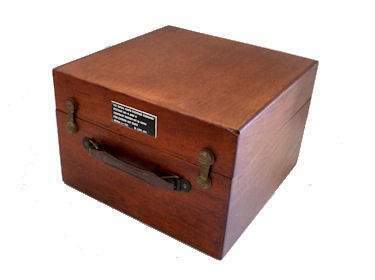 Our records show that M. Low of New York started making these instruments as early as 1970. 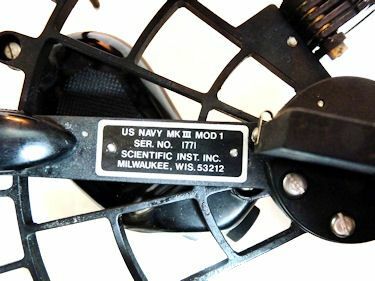 As commonly believed, Scientific Instruments of Milwaukee, Wisconsin whose business dates back to about 1957 may or may not have been the second Navy contractor. That honor might belong to Franklin Instruments which made this sextant on November 1, 1974 shortly after they started in business. However, even though t hey are still operating making electronic clocks, their founder and his son are both deceased, and their present management did not respond to our request for information about their prior sextant business. 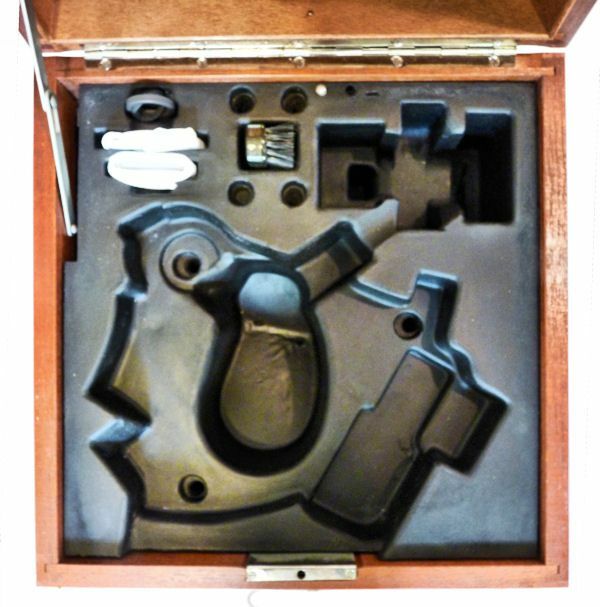 The sextant comes complete with all its original accessories which include a sighting ring, brush, an adjustment wrench and a spare index mirror, all housed in a a Mahogany case that is finished with C. Plath hardware. 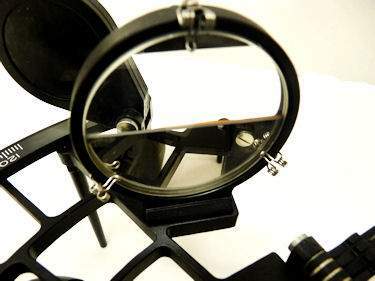 SOME BACKGROUND: A few years after the design of this sextant was adopted around 1971, I became a member of the Navy Department's Navigation Symposium Board, and remember we discussed in detail the criteria that was established for this design. They paralleled the already existing features found in sextants in the civilian maritime industry. The Navy's design incorporating these features was late in coming since the civilian sextants were in use before WW II and were far advanced from the ubiquitous Navy's standby during this period, the Navy MK II. Except for the handle and case, the Tamaya MS 733 and the C. Plath sextants met these criteria as did a few others, but there was strong feelings in government to "Buy American" in contrast to today's World Economy. Consequently, M. Low of New York City was selected for the MK III program, Little is known of this company other than they were in New York and in the instrument business. The sextants were made under license from C. Plath, of Hamburg, Germany who may have provided the tooling. C. Plath aficionados take note, the design is clearly the same as the C. Plath Classic sextant down to the last detail other than its ergonomic handle and large size high impact resistant case. This pedigree is noted on page 119 of the book by Friedrich Jerchow,"From Sextant to Satellite Navigation, (1837-1987) 150 years C. Plath". After M. Low disappeared from the scene, Franklin Instrument of Rosboro, Pennsylvania must have become the second contractor, but this is the only example of their sextant we have seen in 35 years. In this picture is Scientific Instruments, of Milwaukee, WI. who was making these sextants as early as 1975. But they made fewer and fewer sextants as Satellite Navigation (Sat Nav), the newly accepted electronic system, became more prevalent until GPS succeeded it. SIC stayed in business until 2008 when they decided to close their doors. 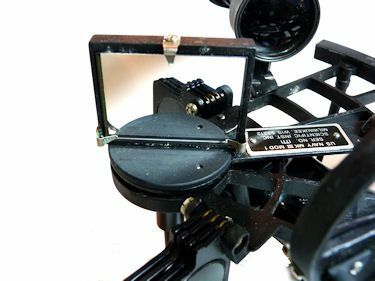 In one of our last conversations with the owners they told us sextants were still being made in very small numbers for newly built U.S. Navy ships at a price of $4300.00. PROVENANCE: We were told by the former owner that the founder of a technology company, an American Indian, was given the sextant by the Navy as a token of their gratitude. The Indian kept it in storage for years, and when he met with financial difficulties he used it to pay a debt. That person sold it to us since he had no use for it. CONDITION: The sextant shows no evidence of use . The interior of the case is new condition. Usually they are torn up in use from the legs missing the holes. The exterior has only one minor light scuff. All its machinery works well. The horizon mirror shows some age along the vertical edge that separates the clear and mirrored portion, but is still near new. A replacement is in the pockets for both mirrors, a $250.00 value. The stainless screws and clamps are bright and shiny and the black finish shows as new. The numbers match on the certificate. The lighting works. The index error is negligible, and there is a touch of side error which is a good thing. The original inspection certificate is included. A C. Plath lock and two keys are fitted to this Navy style case. 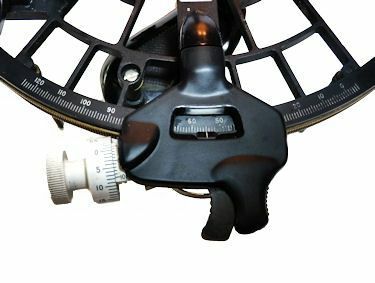 Vernier with 10 indents or each 6"
This is fine sextant is in perfect condition and is backed by our guarantee of satisfaction. 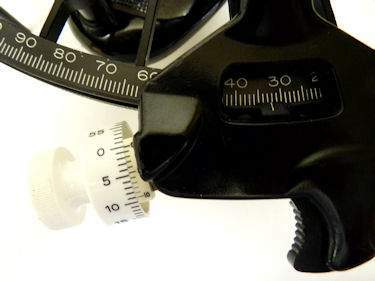 It requires someone who can appreciate the fine points of a sextant, and is willing to pay an appropriate price for this level of quality and excellence. 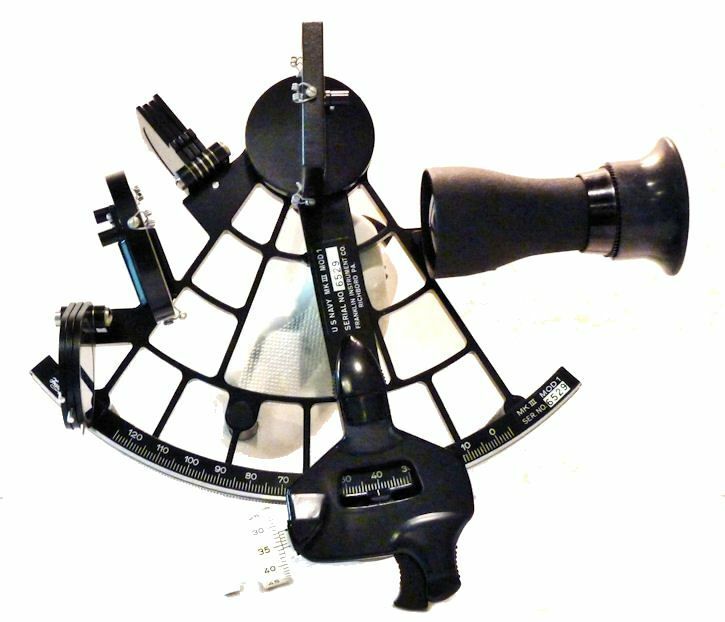 OUR QUALIFICATIONS: We are one of the few company's still selling navigation instruments that know anything about them. For purposes of judging whether Joel's opinion counts, he was the editor of the chapter on sextants of the 1977 Edition of "Bowditch", The American Practical Navigator, NAVPUB 9; a member of the U.S. Naval Academy Navigation Symposium Board, 1975 -1978; the author of a book on marine sextants, Cornell Maritime Press,1975, and the founding president of Nautech Maritime Corporation which partnered with Tamaya of Japan in the introduction of their sextants and the famous NC-2 navigation computer, in the U.S. market. Joel is also a retired Master Upon Oceans, and held a U.S. Navy "D" Qualification as a Senior Skipper - Oceans. From 1995 through 2000, he served as a Varsity Offshore Sailing Team coach at the U.S. Naval Academy. Only three times before have we offered a Navy MK III sextant of this quality. It will be equally home at sea or in a collection of only the finest. 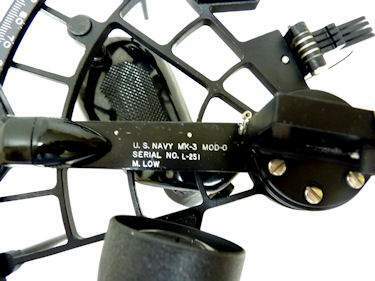 To view our current inventory of U.S. Navy MK III sextants and other premier makes, click here! Presented is only the third Navy MK III that we have offered for sale in seven years. This one was made by M. Low, the original manufacturer of this design. It differs from those made by Scientific Instruments by having the M. Low name engraved on the index arm. Scientific Instruments of Milwaukee, WI riveted a tag on the index arm which lead us to believe SI may have acquired parts from M. Low and used that method to cover the Low name. 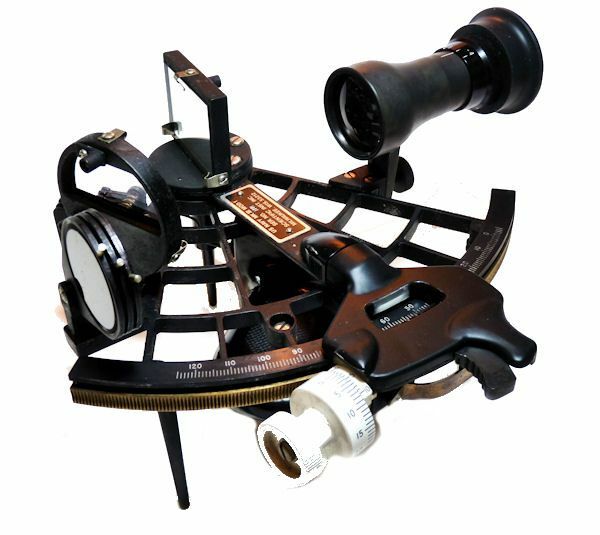 The sextant comes complete with all its original accessories including a spare set of mirrors and a Mahogany wood case. The matching certificate is dated December 3, 1970. 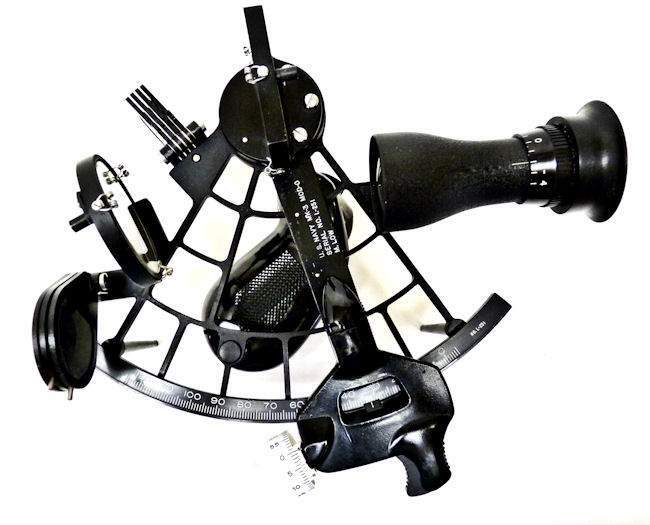 SOME BACKGROUND: At the time the design of this sextant was adopted around 1975, I was a member of the Navy Department's Navigation Symposium, and remember the criteria that was established for a new sextant. They coincided with already existing technology in the civilian maritime community. In total, the new design was far advanced from the ubiquitous Navy WW II standby, the Navy MK II. The Tamaya MS 733 and the C. Plath sextants met these criteria as did a few others, but there was strong emphasis in government procurement to "Buy American" in contrast to today's World Economy. Consequently, two American manufactures were selected for the MK III program. Scientific Instruments of Milwaukee, WI. came after M. Low of New York City of which little is known other than it was a New York instrument maker. 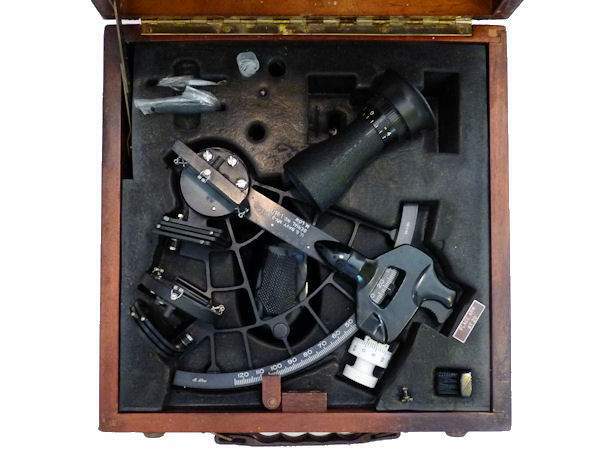 These sextants were made under license from C. Plath, Hamburg, Germany. C. Plath aficionados take note, the design is clearly the same as the C. Plath Classic sextant down to the last detail other than its ergonomic handle and large size high impact resistant case, and this pedigree is noted on page 119 of the book by Friedrich Jerchow, "From Sextant to Satellite Navigation, (1837-1987) 150 years C. Plath". NAVY CELNAV TODAY: The Navy has moved away from traditional celestial navigation and even the use of paper charts. Their reliance is totally electronic position fixing. CelNav is no longer taught at the U.S. Naval Academy. Whether or not ships carry sextants today is meaningless since it is not practiced as part of the daily routine. Nine years ago I went on a brief cruise on a Spruance Class destroyer, USS CARON DD 970. I used the one they had with good results (i.e. within one nautical mile of the ship's GPS position), but no one in the wardroom or the lead quartermaster was interested in taking any sights. I appreciated its lighter than average weight, and comfortable handle. In January 2008, Scientific Instruments ceased operations. Up to then they furnished two MK III sextants to newly commissioned ships at a price of $4300.00 each. 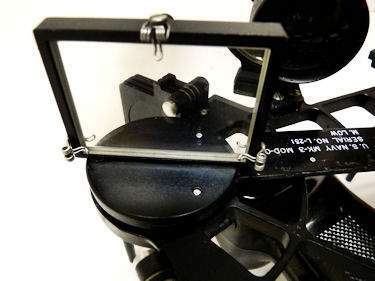 CONDITION: The sextant shows some minor evidence of wear which is mainly due to some stickers placed on the index arm and the back of the index mirror housing. A little of the residue refuses to come off. The rest of the paint is in excellent condition with no imperfections. The chromed screws and springs are all bright and shiny. All its machinery works smoothly. Both fitted mirrors show the beginnings of a few small spots, but will be usable for some time given proper care. They are backed up by a set of new replacement mirrors which we added. There also is a pin on one of the filters that has broken off which doesn't affect its use. The the left adjustment screw on the horizon mirror is bent and the holder's screw is a replacement. We adjusted the sextant to minimum index error. The lighting doesn't work. The nicely refinished Mahogany case shows it has served at sea and has a few scratches on it and a small chip on the front right corner. It has some scattered tiny white paint spots inside the top. The original December 1970 certificate is included and matches the sextant L-251 serial number. No locks are fitted to this Navy style case. The index error is negligible, and there is a touch of side error which is a good thing. 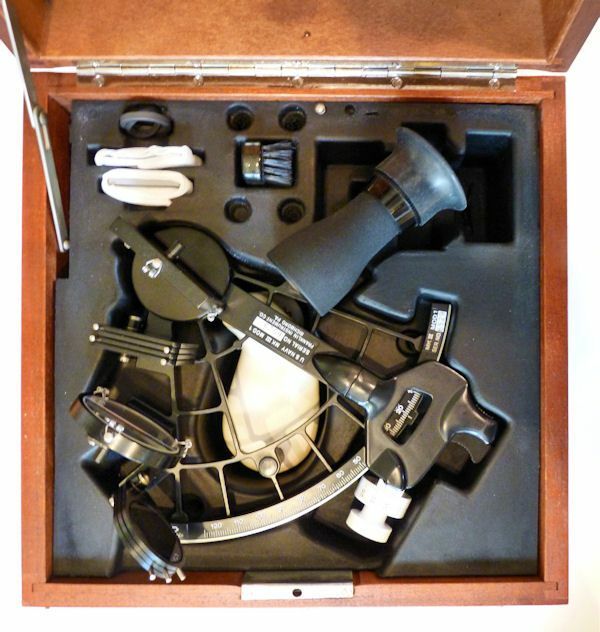 PLATH COMPANY HISTORY: In brief, Carl Plath started manufacturing sextants, in addition to other nautical products, in Hamburg Germany in 1862 by th purchase of David Filby Company, a Hamburg instrument maker of repute, which started making sextants in 1837. As a result WW II, C.Plath was dismantled completely by the occupation forces. Around 1950, various prohibitions were lifted, and C. Plath was allowed to begin production again of sextants and other nautical instruments. Also in 1949,C.Plath was offered a gyrocompass patent and in 1951 the first gyrocompass designed to this patent was presented to the public. C.Plath progressed from the role of instrument maker to that of a modern marine navigation equipment manufacturer. In the following years the product range was expanded by many more modern designs such as autopilots, speed logs, radio direction finders, etc. QUALIFICATIONS: We are one of the few company's still selling navigation instruments that know anything about them. For purposes of judging whether Joel's opinion counts, he was the editor of the chapter on sextants of the 1977 Edition of "Bowditch", The American Practical Navigator, NAVPUB 9; a member of the U.S. Naval Academy Navigation Symposium, 1975 -1978; the author of a book on marine sextants, Cornell Maritime Press,1975, and the founding president of Nautech Maritime Corporation which partnered with Tamaya of Japan in the introduction of the MS 733 Spica, the MS 833, Jupiter, MS 933 Venus sextants and the famous NC-2 navigation computer, in the U.S. market. Joel is a retired Master Mariner, and held a U.S. Navy "D" Qualification as a Senior Skipper - Oceans. 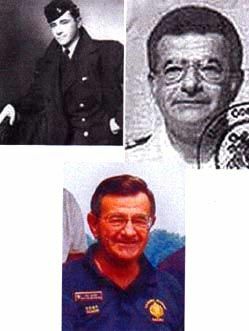 From 1995 until 2001, he was a Varsity Offshore Sailing Team Coach at the U.S. Naval Academy. International buyers welcome, but inquire first. We have satisfied customers in Argentina, Australia, Austria, Belgium, Bermuda, British Virgin Islands, Canada, Chile, China, Czech Republic, Democratic Republic of Congo, Denmark, Estonia, England, France, Germany, Greece, Holland, Hong Kong, Hungary, Iceland, Indonesia, Ireland, Israel, Italy, Japan, Kuwait, Latvia, Luxembourg, Malaysia, Martinique, Mexico, New Zealand, Nigeria, Norway, Nova Scotia, Panama, Philippines, Poland, Portugal, Puerto Rico, Romania, Saudi Arabia, Scotland, Singapore, Spain, St. Maarten, Sweden, Switzerland, Thailand, Turkey, United Arab Emirates, USVI and the Eastern Caribbean.